First I wanted to reflect on my items from this capsule and compare them to my 2016 spring capsule. My style has changed immensely from last spring but many of the items are the same. My color palette still includes a lot of blue and lighter shades of denim but I transitioned to more wide leg/crop pants than skinnies and introduced blush (my not so neutral neutral) into the mix. I have continued my dress over jeans experiment which is now more of a permanent style option and my clog love began last spring and is still going strong. Here are some outfits from spring 2016 compared to spring 2017. Look at the difference! My 2017 style feels more polished and sophisticated which is something I’ve been striving to work towards. I’ve also introduced more natural fabrics into my wardrobe and more high quality pieces. I think the investment definitely shows! Now here are the items that were in my spring capsule. Overall I was very happy with the items I chose. My most worn items were my blush silk blouse, grey skinny jeans and navy suede heels. The only item I didn't really wear was my clyde pants. I love the material of these pants but I've come to realize I'm not crazy about how the pockets look on me. I'm more pear shaped and having pockets that hug my hips just doesn't feel flattering. The rest of my items were in heavy rotation and I really could have used a few more long sleeve pieces and cardigans. I'd also like to find one more lighter coat for the spring transition. Here are some items I currently have my eye on to fill in the gaps in my spring closet next year. | DENIM DUSTER COAT | ali golden purchased secondhand | size: m/l (height 5'5" weight 127lbs) | similar from minimum ($100) | similar from esby ($200) - I had passed on this coat last spring and when I saw it while thrifting I couldn't pass up the opportunity! This became my go to coat as it started to warm up a little (mostly worn for upper 40s low 60s temps). | SIMPLE BLACK DRESS | c/o sotela | size: small (height 5'5" weight 127lbs) - this was actually an item on my winter wishlist and Hanna from Sotela was generous enough to send me one to style! This has been one of my favorite additions to my closet to date. The material is fantastic and you automatically look chic right when you throw it on. I styled it in two different ways and shared my review here if you want to see more! | SAILOR PANTS | jesse kamm | size: 6 (height 5'5" weight 127lbs) - I had been eyeing these pants since last spring and was finally able to pull the trigger for this season after several months of saving! All I can say is they are definitely worth the investment if you're into wide leg crop pants! I ran into a time crunch with my posts and wasn't able to share a proper recap of my spring 10x10. 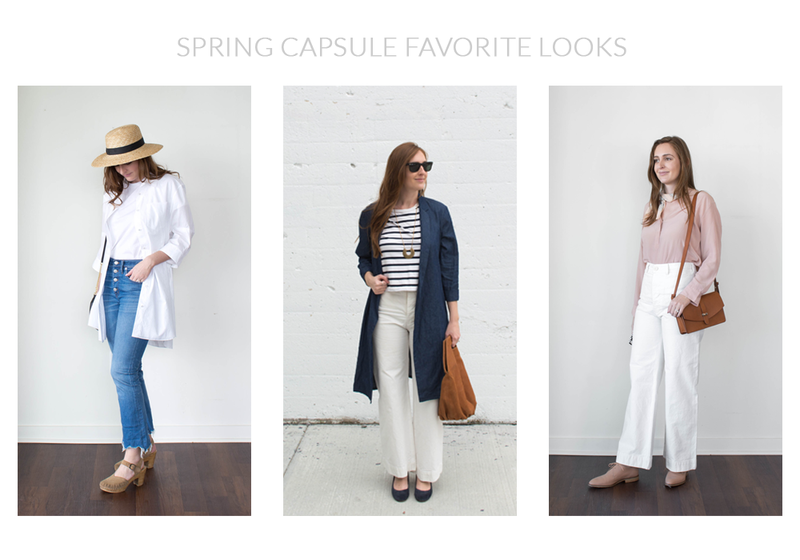 So to make up for that I'm going to combine my 10x10 learnings with my overall spring capsule recap. To be honest they really go hand in hand anyways! 1. Colors can be a great way to discover new outfit formulas. I have never tried creating an outfit by focusing on the color palette instead of pieces. For my past uniforms I would start with a bottom then add a top maybe an outer layer and finally accessorize. But for some of my outfits this season I focused on picking a color and building off from there. This is something I want to play around with more in summer! 2. Get out all of your accessories before you decide you need a new one! When I first started my 10x10 I couldn’t think of any of my handbags that would go with my looks! Immediately I started thinking that I would have to buy a clutch or two to help me style. Then I took a step back. Got out all my handbags and started to play around with them in my full length mirror. Turns out I had some that I could work with! I almost fell into a shopping spree trap but by laying out all of my options I was able to find something I already had. I’m very much a visual person so sometimes laying it all out is the best way to go! 3. Blush is here to stay! Last spring I was craving a warm tone to brighten up my spring wardrobe. I dabbled in blush but wasn’t sure I wanted to invest in the color just yet. For this spring capsule I was once again craving blush tones so I opted to add a few more blush beauties into my closet. I can already tell that this is going to be my color for spring so I’m looking forward to adding one or two more blush pieces to my wardrobe next year! 4. When in doubt full tuck. Pretty much 90% of my outfits are tucked. Most of the time it was a front tuck that was a little messy but I’ve been loving how clean a full tuck looks. Especially if the pieces in the overall outfit are a little casual. It just elevates the outfit a little more in my opinion. If you want a perfect example scroll back up to my 2016 vs 2017 example with my stripe courier shirt and you can easily see what a difference the full tuck makes! 5. Be realistic about the weather. I’m still working on this one. Honestly, every season I’m working on this one. I still seem to have a fantasized vision of spring. I needed just a few more long sleeves than short sleeves and maybe a few more cardigans for layering. Now that we’re moving to Portland I’ll have a whole new weather system to figure out but at least I can try to be a little more mindful! | OUTFIT 1 | This look was my first time experimenting with wearing a shirt dress as a top layer and I love how it turned out. I really like the monochromatic top half and think it makes the look appear more cohesive. The make shift duster is now one of my favorite tricks! Also, this outfit screams flea market fun all over it! | OUTFIT 3 | I love how put together this first look is. It’s polished yet the wide leg adds a touch of fun. I’m also really digging bandanas and like how it adds a more casual element. This is a great outfit for weekend brunch or window shopping! This look was my first time experimenting with wearing a shirt dress as a top layer and I love how it turned out. I really like the monochromatic top half and think it makes the look appear more cohesive. The make shift duster is now one of my favorite tricks! Also, this outfit screams flea market fun all over it!